What Can Brands Do About Ocean Plastic Waste? Plastics play an integral part of all of our lives, but gyres of plastic waste are now swirling across hundreds of thousands of square miles in the Pacific Ocean and other bodies of water. As one who has worked in marine conservation and tested the health of New York City’s Hudson River, I’ve watched this problem of plastic waste in the oceans grow and become increasingly passionate about it. I’m trying to take steps in my daily life, and every one of us can too. There is wide agreement about the need and urgency to find innovative ways to make plastics more sustainable. According to the Plastic Disclosure Project of the Ocean Recovery Alliance, an estimated seven million tons of plastic trash — including bottles, fishing nets, grocery bags and even microbeads in cleansers, finds its way into our oceans annually as a result of littering, illegal dumping and other sources. Aside from the obvious harm ocean plastic waste causes to marine life (cue infamous image of seabirds unfashionably donning soda can rings), plastic waste does not biodegrade in oceans so it merely breaks down into tiny pieces that can make its way back into the food chain. Most major brands of water and soft drinks are spending millions every year to find innovative ways to address plastic waste, but there is still more that must be done. Poland Spring, for example, reuses their five gallon jugs upwards of 200 times before recycling them, according to the company’s website. However, their ubiquitous 500mL water bottles made with an ‘Eco-Shape’ design despite using 60% less plastic than the original bottle, will continue to amass in landfills, oceans, and elsewhere until their parent, giant Nestle Waters can find a way to deliver the benefits by using recycled plastic (or a different material altogether), or by employing a refill system. Several brands have introduced plastic packages made from renewable materials, among them, Sun Chips’ compostable chip bag in 2008 and Coca Cola’s ‘PlantBottle’ in 2009 made from ‘up to 30% plants’. Using renewables weans us off petroleum-based plastics, and you have to credit Coke for making sure the plant-based bottles are recyclable with other kinds of PET (#1’s). But did you know that even if they were made up of 100% plants they would still not be biodegradable? The oceans are too cold to promote biodegradability of even organic matter, much less ocean plastic waste. That’s why we’re finding ships that sank at sea hundreds of years ago with their booty intact. Even 100% compostable containers require commercial-scale, hot temperature-controlled composting to actually break down the product – a home or community compost won’t do the trick. A bit of sun peaked through murky waters in 2012 when cleaning product brand Method debuted a new bottle made from a combination of recovered ocean plastic and post consumer plastic. Method’s ‘Ocean Plastic’ bottles are partially made from trash that has washed up on Hawaiian beaches, thus preventing more plastics from winding up in the Great Pacific Garbage Patch. 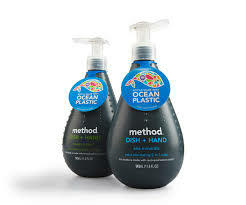 Designed to raise awareness for ocean plastic waste and what can be done about it, Method’s website contains alot of helpful information about the issues, why the black bottles are ‘beautiful’ and what a company the size of Method is doing about it. Hat’s off to company co-founders Adam Lowry and Eric Ryan for being the first to make a start in taking plastic waste out of nature’s path. Another notable victory for a little brand that’s trying to do something to reduce the problem of ocean plastic waste: Bureo Skateboards. At Earth Day New York festivities this year, I was instantly drawn to the not-so-typical products tables, and among them was Bureo brand skateboards whose decks are made from plastic fishing nets discarded off the Chilean coast — a meaningful step forward given that discarded plastic fishing nets account for 10% of ocean plastic pollution worldwide. To boot, Bureo pays local fishing communities to collect the discarded nets, providing a source of jobs and economic activity. As of this writing, Bureo raised more than double their goal via Kickstarter to begin shipping boards made from reclaimed ocean plastic waste worldwide. Plastic waste in the ocean, for the most part, is largely avoidable with the daily employment of typical reduce, reuse, and recycle tactics. Even if you live far inland, there’s a lot that an individual can do. Did you know that only 30% of plastic containers are recycled, so upping the recycling rate can certainly prevent more plastics from finding its way to the sea. Use refillables for water, soda, coffee and other drinks. Become conscious of all the times throughout your day that you use single-use plastic items like cups, plates, cutlery, and grocery bags. 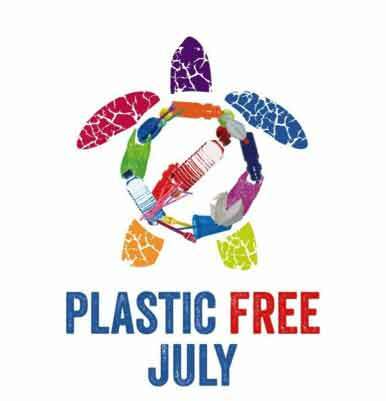 As Gabrielle Grime recommended to us this time last year in a post called What are You Doing for A Plastic Free July? you can challenge yourself to go without single use plastic packages and other items for a month this summer. I for one will be taking the Challenge HERE. Unlike bottles that can be collected for recycling, microbeads are designed to wash right down the drain. Take time to research this issue further and pressure brands, retailers, and government to remove them. One campaign in this regard is Beat the MicroBead being run by the not-for-profit group, 5Gyres. The success of such brands as Method and Bureo to reclaim plastic waste and reuse it in a creative way leaves me with hope that it is possible to make the necessary strides toward preventing even more plastics from polluting our oceans. If Method and Bureo can do it, others can too. So nudge your favorite brands into a ocean-plastic-reducing direction. I’d love to hear about things you do and the brands you support because of the good they do to reduce plastic waste. So if you have any ideas or know of any other initiatives to keep our ocean blue and our marine life safe, please let me know! Starbucks Reusable Plastic Cups — Green Marketing or Greenwash? Having grown up a Jersey Girl, Katherine loves both the nature of the shore and the city's skyline. She is a graduate of Penn State University with a Bachelor of Science in Geography and Environmental Inquiry and just completed her Master's at New York University. Working in environmental conservation research, Katherine also loves finding creative ways to waste less and help others live a greener life in the concrete jungle. Read more stories from Katherine HERE. I remember the day very clearly when I first learned about the “Pacific Garbage Patch.” It was beyond depressing, because I felt powerless. This young Dutch inventor is actively planning to do something about the crisis: http://www.dailymail.co.uk/sciencetech/article-2415889/Boyan-Slat-19-claims-invention-clean-worlds-oceans-just-years.html. As Kate detailed, it’s great that producers are slowly taking responsibility for their hand in the crime. But ultimately consumers have to stop being so ignorant and apathetic. On a recent trip to NYC, I took my son to the pier in Red Hook, Brooklyn and I spent about 15 minutes cleaning up plastic bottles, bags, Styrofoam containers and other small pieces of plastic litter practically hanging by a thread, blowing in the wind, and just waiting to land in the water. I couldn’t bear the thought of these things taking flight and joining the gyre. If I could have waded into the water to rescue that floating Styrofoam cooler I also saw, hitting the rocks with every wave down below, I would have. But even hyper-conscious environmentalists like myself have to draw the line somewhere. We MUST halt the consumption cycle and make plastic to-go culture a thing of the past. Is it ever going to happen? People are lazy, our society is built around convenience and habits are so deeply ingrained in all of us. Even if there were 100 companies like Method and Bureo creating products out of existing ocean plastic debris, the damage has already been done. On second thought, maybe I can be optimistic and apply Jevon’s paradox to the situation: the demand for more products derived from ocean waste might actually CLEAN UP our oceans over time! This is a great article. I’ve removed as much “disposable” plastic as possible from my household. The idea of reusing Garbage Patch plastic in other ways is extremely exciting. 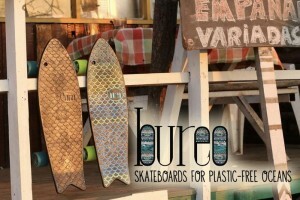 I especially loved the Bureo skateboards from fishing nets. Thanks for your comment Ashley! Bureo and Method certainly show us there are multiple creative ways to reduce this already wasted material, turning it into something new without creating new materials and while doing something important for the stability of our marine ecosystems. If nothing else, such products help to raise consumer awareness of the issue. Thanks for the heads up Jeremy! Fredrica, great to hear celebs are also addressing this important issue. I was unaware of either of those exciting campaigns. A great piece of big names and big-name brands coming to action is that it raises awareness to the problem. If plastic ends up as pollution it is failed design.. pure and simple. Manufacturers love to blame “litterbugs” but that behavior can be eliminated by smart design. . Refillable bottling systems as used in Germany are a great example. Having international standards on reusable packaging and massive taxes on disposable is going to play a major role in ending this problem. The bottle waste to clothes projects are unfortunately a well intentioned disaster, not only do they provide free green washing for polluting corporations they send the message synthetic clothes are ok, and worst of all each time they are washed they release thousands of microplastic pollution fibers (the most dsngerous form of plastic pollution :(. Hemp clothes are the best for a healthy ocean! The thing is, there is so much we can do against plastic waste, but it needs sufficient awareness first, and more thorough understanding of the causes and consequences, and people taking responsibility.. At the individual level, people need to make the right consumer choices and speak to their leadership, at the business level, access to sufficient plastic-free food and other necessary items need to be made available, as well less emphasis, advertisement or marketing for plastics/throw-away culture. At the government level we need leadership, so larger changes can be implemented effectively (e.g. plastic bag bans). I think these things need to come together somehow, and quickly. With our new Plastic-Free Tuesday initiative we hope to at least work on awareness at the individual level, and support people who want to make a difference through/in their daily lifes, in a very practical manner, even though it can be quite hard the moment. Yet, at the same time, we have also been posting about Nestlé recently, and how some of the problems related to plastics are also related to other problems, such as the bottled water industry generally. For example, as long as Nestlé is in the business of buying up fresh water supplies in various parts of the world, shipping that water in plastic to other parts of the world where that water might not be needed (e.g. cause clean local is a very viable alternative there), are we not trying to create a solution to a problem that should perhaps not exist in the first place? We feel very strongly for example that is important that efforts and investments are put into exploring the possibilities of providing good local tap water systems and boosting people’s confidence in such systems, meaning that commercial bottled water/drinks may loose their (marketed) appeal. If people start refusing such practices, and demanding change, than we can hopefully achieve meaningful change in other respects as well! But awareness needs to grow, and business need to play it’s part. Thank you for addressing the issue of microbeads in facial cleansers; this is a hugely underpublicized issue, and in my circles I have never met another person who was aware of the environmental impacts of their fruity fun face scrubs. Another issue I’d like to raise is the dependance of island communities on products with large amounts of packaging. Due to their lack of natural resources and infrastructure, many islands around the world (e.g. Hawaii, South Pacific, and the Caribbean) are forced to import much of their food and commodities. Without effective waste mitigation in spatially constrained communities, plastics and other materials inevitably end up in the ocean, further jeopardizing limited local environmental resources. Needless to say, the Garbage Island phenomena is one of the most important global pollutant issues which needs to be addressed for the good of ALL. Thank you for all the information, Katherine. I wasn’t aware that ocean temperature is a limit to biodegradability (sustainability aside for a moment, your point about sunken ships is really cool), and I certainly had not thought much about microbeads. The efforts you described by Method and Bureo are definitely significant – we need to figure out ways to reuse plastic instead of just dumping it. But we also need better methods of reducing plastic use overall! Poland Spring has done some work, as you said. But I’m hoping for a greater focus on reusable glass containers (and encouraging people to bring water bottles everywhere) and probably also initiatives to clean up drinking water. Nearly a year later and microbeads remain a hot topic of discussion for state senates around the country. Though for too many, microbeads and their PCBs seem to be just that–a discussion with solutions to be made at a later date. In the past month, California joined the list of states aiming to ban the use of these plastics; however, the state is willing to wait another five years before these measures take place. A great article to come across on World Oceans Day! Plastics are harmful, wasteful, and unnecessary. I always take my reusable bags shopping, use my reusable glass water bottle, bring my thermos to coffee shops, and pack my lunch in freezable cooler with glass containers and metal silverware. It still surprises me how many people don’t recycle and how many people waste so many plastic bags and coffee cups without question. No one would throw their plastic into the ocean at the beach, so why is this accepted? One plastic item I wish would go away completely are the plastic pods for coffee makers! Machines like the Keurig and Nespresso have pods that can’t even be recycled. We teach people with machines like this that convenience is more important than the environment, which is totally backwards and why are in a situation like this. Fantastic article, very informative, particularly about the oceans being too cold to promote biodegradability, something I had no idea about! Evidently, we have a serious problem on our hands, especially in light of the statistic that there will be more plastic than fish in the sea by 2050 (http://www.theguardian.com/business/2016/jan/19/more-plastic-than-fish-in-the-sea-by-2050-warns-ellen-macarthur). However, as you have noted, there are companies doing things differently. Instead of seeing plastic in terms of waste, they are seeing it in terms of opportunity. Adidas is currently working on ‘knitting’ shoes entirely from ocean plastic (http://www.fastcoexist.com/3048033/adidas-knit-these-sneakers-entirely-from-ocean-plastic-trash#5). Equally, http://sustainablesurf.org/ are creating surfboards from ocean plastic waste. Let’s hope there are more and more innovative companies in the works! This article was very informative and gave me a lot of hope for the future of innovation and business. I really loved reading about both Method and Bureo and the way in which they utilize waste to create new products and advocate to reduce the immense plastic issue plaguing oceans (and land). Aside from the ideas mentioned in the article regarding being a conscious consumer and supporting businesses or encouraging companies to change their ways, I am also a huge advocate for making one’s own cosmetic products. I make my own shampoo, conditioner, deodorant and lotion. Though it may at first seem time consuming, it’s actually quite fun and you can create products that suite your needs perfectly! Most importantly, it can eliminate the use of plastic because most of the ingredients can be bought in glass jars (reusable) or compostable paper bags! Lotion: There are many recipes. I currently use shea butter, arrowroot powder (to reduce oily-ness), coconut oil, and essential oils! Conditioner: I just use coconut oil! It’s sad to think that our plastic of the past (and present) is helping to create a geological layer, testimonial of the Anthropocene. Our traces will be discovered by a future geologist and this period made by our “fossils” will demonstrate our inability to live in symbiosis with the Earth…nothing to be proud of, I’m afraid. I live on the Seine River in Normandy in France, near Paris and spend hours cleaning the river banks, full of plastic bottles, bags, soft drinks cans … I also do it where ever I travel in France, Europe or abroad. It is depressing to see that people carry on throwing so much rubish in the rivers, seas and oceans. I live on a river too — the East River in New York City. It runs into the Atlantic Ocean. Knowing this, I am very careful to pick up stray plastic in my neighborhood. Just one bag can kill a bird, turtle or fish. I think if more people understood this, they would not tolerate plastic litter. Thank you for all of the additional resources Justina, Alessandro, Nicole, and Shreya. It’s vital to have so many great ideas on how to reduce using plastic in addition to addressing waste in the ocean. I mentioned in this article Bureo Skateboards was doing a great job, and thought it might be worth noting they’ve expanded to make sunglasses out of ocean plastic waste. Even if boarding is not your thing, there are still other ways to support this crucial form of recycling. Adidas has a new partnership this year as well to make running sneakers from ocean plastic called Adidas x Parley. Finally, singer Pharrell Williams recently released a clothing line called RAW for the Oceans. All of the products within this line are at least partly made up of plastic found on shorelines. Katherine did you see my comment re harmful microfiber plastic pollution? I’m surprised you seem unconcerned. Synthetic clothing is a big source of microplastic pollution and recycled plastic clothing still pollutes. The fast fashion industry is one of the most polluting industries on earth and they are attempting to rebrand polluting polyester as “ocean friendly”. Great article! Although individuals can make large impacts, I feel as if companies/corporations can have big impacts by promoting these habits among their employees. Upcycling can be done on a local scale – I know that at my high school, we used plastic bags to crotchet various objects for a marine biology project. I know there are some companies that are switching to bio-degradable packaging such as Saltwater Brewery. I’ve attached a link on upcycling plastics below. I think this is so interesting and there are many great points and initiatives brought up by different brands. My question is where are the sources and how am I able to contact these brands to influence them to change? Interesting article, this provides interesting precedents to look at of brand that are attempting to be more sustainable in their packaging design. I am left wondering how I am able to participate and to help influence change in these companies, it would be helpful to host an event or have links for how to contact their CSR department. Also, where are the sources for this article? Great article! Because I have worked with multiple marine conservation groups, the issue of plastic pollution really hits close to home! I love this perspective of plastic pollution, that the manufacturers are just as much, if not more, to blame as the litter bugs. If a change is made in the industry, it will trickle down to the consumers and lead to a widespread decrease in the use and consumption of plastic. The Ocean Cleanup is one of many efforts being undertaken to remove waste from the ocean, they estimate that they can remove 50% of marine debris in just 5 years! However, while this will make an enormous difference in the state of our marine ecosystems, it is not a permanent solution. In order to restore our oceans, the amount of plastic products available to consumers needs to be drastically decreased. I love that Method and Bureo are using ocean plastics to create some of their products and I want to encourage more brands to do the same. Whenever I go into ice cream shops with plastic tasting spoons I cringe. I wonder if there are any companies that produce ocean plastic cutlery. Do you know of this exists? I would love to nudge cutlery producers in that direction!